Let’s calculate voltage drop in transformer 1000KVA, 11/0.480 kV, impedance 5.75% due to starting of 300 kW, 460V, 0.8 power factor, motor code D (kva/hp). Motor starts 2 times per hour and the allowable voltage drop at transformer secondary terminal is 10%. Calculation can be checked by using this MS Excel Spreadsheet dedicated especially to this kind of problem. Motor full load current = 300 × 1000 / 1.732 x 460 x 0.8 = 471 Amp. 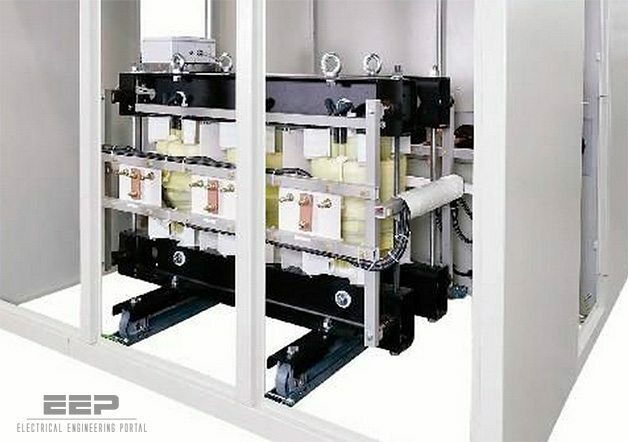 Transformer full load current = 1000 / (1.73 2× 480) = 1203 Amp. Here voltage drop is within limit and Motor full load current ≤ TC full load current. kindly mention IS or IEC standard from which voltage drop formula used for transformer sizing has been furnished. if we start 1000 kva generator( prime power-800 kw, output voltage-440 v) and we want to produce 11 KV voltage with a tranformer(step up) to the load of generator. what rating s of x-er to be connected. if 1000 kva rating of x-er , the generator tripped? or if uses 1500/2000 kva x-er is it safe? Awaiting reply for all above comments. kW rating given for motors are normally output mechanical power. it must be converted to input electrical that is why efficiency come in to play. (1) Motor inrush Kva at Starting (Irsm) = Volt x locked rotor current x Full load current x 1.732 / 1000. (2) above is the correct relationship. how to find out powe HT TX correct number of turns for primary& secondary winding, size of the winging conductor, core size as we know primary voltage/secondary voltage & secondary load. Load plus 30% to 50% future load add. Then after calculate. 33 kva 2400/240 V, 60Hz….here I want to know that the secondary voltage V2=240V is at No Load or Full load…if it is at No load or at full then please explain how.. Thanks for the calculation its so helpful, however I have a small doubt. As regards the motor starting 2 times per hour, no 20% was added to the motor’s minimum kVA rating to compensate for heat losses within the transformer as said in many references. Please clarify , if starting the motor 2 times per hour has little or no impact as nothing was mention in your calculation. I have one compressor with 20HP motor and our transformer is 200KVA, due to strarting current of motor a voltage drop is there which affects other machines. How can i minimise the same. sir i m interested in opening a saw.mill . for.that i m installing a 15 hourse.power electricity moter. department.sying thae.above said.moter will take.a.load.off 100 killowatt. will u please help me.to calculate.the load. Which better % impedance of distribution transformer, a higher % or lower %? Based on my understanding, selection of Z% of the transformer depends on the distribution system. If you have another transformer to be paralleled, where the KVA are similar, we will definitely select the same Z% for both transformers. This will ensure equal load sharing and avoid circulating current in the transformers windings. If your installation solely relying on only 1 transformer, now, you can select any size of your Z%. This Z% will be useful especially to limit the fault current. The higher the Z% the lower the fault current can be reduced. However, in the future, if there is a new installation, you would consider the branches being connected to your distribution system. Introducing a load / source in parallel to your system will increase the fault current in your system. So depending on your application, you decide which Z% to be applied by considering the philosophy of your system operation, your transformer configuration/connection (parallel?) and considering the fault level in your system. This will also lead to your sizing of cables and busbars as well. I hope this help. Appreciate for your feedback / comment. There is a error in the attached excel calculator. It calculated kVA by multiplying kW and power factor. Actual equation is kVA=kW/power factor. Hi! I’d like to know, what standard did you use for the locked rotor current? I want to get this into detail, if the output of this transformer is connected to load of small industries (assume same data), What factors are to look into while selecting cable for the secondary of transformer up to the LV panel. 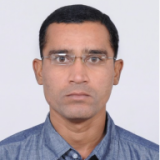 Dear sir i hope u r doing fine..your website is very helpfull for engineering articles.many thanks for creating a such type of website. We are going to set up a new project.Biggest motors are of 260 KW x 2 and 245 KW x 4. Total running load is expected of 3100 KVA.Please let us know the size of Dist.Transformer of 11 / 0.433 KV when we starts these heavy motors.All motors are proposed by VFD.We are working around 3500 KVA Transformer.Please guide us. Please furnish relevant standard for the portion” Motor full load current ≤ 65% of Transformer full load current”. Efficiency not considered while calculating full load current of motor. I have found formula of motor inrush kva at starting time wrong because when i use your formula the motor kva must be 795353 kva ( motor capacity is 300 kw). but, i see your electrical article 1688 kva. I have one question which is if I want to calculate the transformer size & volt drop due to building of 11.89 Km square. Can I use the important above tips to calculate it ? This calculation for DOL motor starting only or for any starting method , also kindly give me information about the following standard in the point ”Motor full load current ≤ 65% of Transformer full load current ”. The logic that motor F.L current shall be less or equal to 65% of transformer rated current is not clear. Please furnish the relevant standard. The above calculations does not consider additional loads which might be fed from the same transformer feeding the large motor.